Tony Horton took everything he learned from P90X and P90X2 to create P90X3, coupled it with new science that shows intense 30-minute workouts can get you in better shape faster, and slammed it all into overdrive. Order now and get Tony’s bonus workout DVD “On One Leg“, (a $19.95 retail value). Beachbody has provided Intense Fitness with a limited supply of these bonus workout DVDs and we are giving them away with each order of the new P90X3 workout. *This is a limited time offer only, while supplies last. 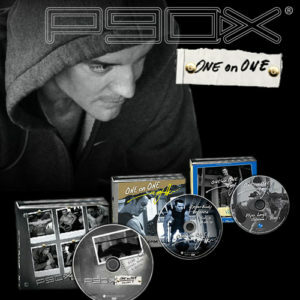 P90X3 is here, no more excuses about "not having enough time", using the Muscle Acceleration system, 30 minutes is all you need. Tony Horton took everything he learned from P90X and P90X2, coupled it with new science that shows intense 30-minute workouts can get you in better shape faster, and slammed it all into overdrive. No more excuses! Everything you need to get ripped and drop body fat faster is packed into these 30 minute workouts. Each workout focuses on resistance, power, flexibility, balance and cardio, in combination with Tony’s new Muscle Acceleration, to bring you an intense 30 minute workout each day. Is a full body workout with a focus on resistance. An upper body workout with a focus on strength by stacking push ups and pull ups in a whole new way. As the name implies, this is a 30 minute cardio burn designed to leave you empty! An upper body workout with a focus on time under tension, which is key to creating lean muscle growth fast. Just like “eccentric upper”, but for the lower body, time under tension for the big lower body muscles. A resistance. workout for the whole body, if your feeling adventurous, double up on this one! This is a power workout, using a fusion of aerobic and anaerobic energy. This workout focuses on increasing speed and power using explosive next generation plyo. A power workout that focuses on multi angle deceleration training. A full body cardio workout, resistance combined with intervals. A martial arts based cardio workout for a full body burn. A unique full body cardio workout designed to increase cardiovascular and muscular efficiency. A workout which focuses on core muscles, flexibility and balance with influence from traditional yoga. A combination flexibility and balance workout, Pilates fundamentals meet modern science. A workout focusing on core muscles, flexibility and balance using isometric contraction combined with instability. A workout focusing on core muscles, flexibility and balance increasing range of motion, flexibility, and stabilization. The workout is only half the battle, the other half is all nutrition! Tony takes the proper nutrition and lays it out in an easy to use daily suggestion format for proper nutrition to fuel the body during workouts, while watching caloric intake. Tony’s new fitness guide outlines the entire program and shows the proper form for each exercise, while giving insight on how to tailor the program for each individual. 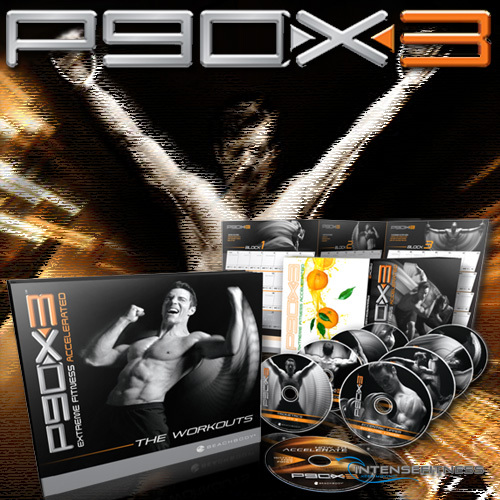 The How to Accelerate DVD is an overview of the complete P90X3 system, which takes you through nutrition, supplementation, vitamins and safety. Have questions? …get answers and much more from the P90X3 community. Order now and get Tony’s bonus workout DVD "On One Leg", (a $19.95 retail value). Tony took everything he learned from the creation and implementation of P90X and P90X2, along with new science that shows “intense” 30 minute workouts periods can get you in better shape faster and combined it all together to create P90X3. A brand new dynamic and intense 30 minute a day home workout program using Muscle Acceleration. Short, targeted, intense workouts that take just 30 minutes, but leave you looking like you’ve been tearing it up in the gym all day, every day. At the heart of the new P90X3 system is Tony’s “Muscle Acceleration” system – a new science that shows intense 30 minute workouts can get you in better shape faster, and slammed it all into overdrive. The result? Short, targeted, intense workouts that take just 30 minutesbut leave you looking like you’ve been tearing it up in the gym all day, every day.